BRMC is a 188 bed, acute care facility that has provided competent and compassionate care to the Central Texas area since 1969. Our commitment to progress in diagnosis and treatment is combined with a dedicated medical care team. This commitment continues to be the key to our success. BRMC services include inpatient care, outpatient services, emergency care department (Level 4 Trauma), women's center/obstetric unit, skilled nursing unit, sleep lab center, Heart Center, Interventional Cardiology Services /cardiac rehab, Walker Cancer Center radiation/medical oncology, outpatient and inpatient surgical services, gastroenterology lab, and a hospitalist program. The imaging and diagnostic services are provided in-house and in a freestanding outpatient center. We have a freestanding Wound Care & Hyperbaric Center, the BRMC Fitness Zone & BRMC Therapy Zone. Other care services offered include: Four One Source Family Care Centers located in Early (includes Occupational Medicine), Rising Star, San Saba & Santa Anna. For more information about BRMC and its services visit BRMC-CARES.com. 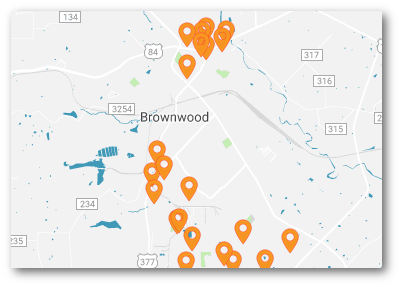 Click here for a list of Health and Medical Centers in the Brownwood area.